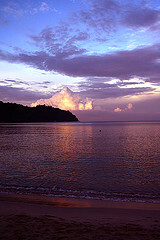 The Sembilan Islands are located off the west coast of peninsular Malaysia about 15 nautical miles from Pulau Pangkor and are accessed by boat from the mainland. Sembilan means nine and there are several dive sites around the nine islands, with more still to be discovered. Marine live is prolific and coral reefs are healthy. The main disadvantage of this area is poor visibility which is rarely above 15m and often as low as 5m. The best time to dive here is November to March which is the opposite season to the east coast of Malaysia and makes it popular with Malaysias divers when the east coast is in low season. A popular dive site is white rock with steep walls that drop to 40m and are covered in coral and seafans. Large schools of snapper and trevally can be seen plus parrotfish, angelfish, butterflyfish, wrasse, triggerfish and morish idols can be seen. Between the islands, current flows through the channels, attracting larger pelagics like barracuda. On the fringing reefs turtles are often seen. Moray eels are numerous. Many types of nudibranch can be seen as well as other macro critters like shrimps, gobies and blennies. Seahorses can be spotted by the eagle eyed diver. Pulau Pangkor is a tourist island that is better for snorkelling than scuba diving. The stunning white sand beaches slope gently into clear water. Pulau Jarak is a small uninhabited with a submerged reef that has very good marine life coverage. Currents can be strong here.